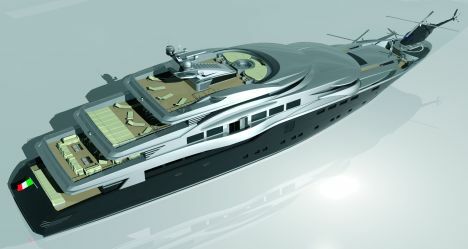 Luca Dini Design Studios are responsible for the exterior lines, the layout and the decor of the new Admiral 65, whilst AMY (Admiral Mariotti Yachts) have taken care of the naval architecture and engineering aspects. It is a steel built, five decker, with an aluminium superstructure characterized by the elegance of its modern aesthetics as well as by its sober and functional interiors. The rather broad beam ensures a great deal of interior space giving room to luxurious surroundings especially designed and developed to offer its guests the ultimate in comfort. Just on the subject of comfort on board, the boat has been designed to guarantee very high standards and its construction will also be accomplished by using special techniques to eliminate or at least drastically reduce, all possible noise coming from the engine room or services area. Special attention was also given to the design of the outer spaces of the Admiral 65', which offer avant-garde solutions in terms of living space and its use. In addition to the saloons placed on the decks astern and on the fly, panels of very generous proportions are fitted along the sides of the main deck running abreast of the saloon and the owner reserved area, and thanks to an electro-hydraulic device they may be lowered and muted into true terraces overhanging the sea. Like with all AMY vessels, The Admiral 65 also fulfils the International Certification of Ecological Compatibility requirements in respect of the safeguard of the environment. For further information please visit the following web site: www.cnladmiral.com. Class: Lloyd's Register of Shipping X100-A1-SSC-"Y", Mono, G6, X; LMC-MCA.